Playtime Season 2 concludes with “Showdown”. As Warren desperately tries to fight off the remaining invaders, Cobra faces his greatest challenge yet. 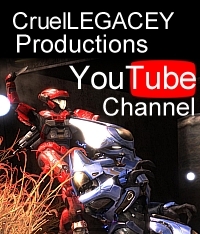 This entry was posted in Episodes, halo reach, Playtime and tagged machinima, playtime, season 2, showdown. Bookmark the permalink. �Showdown� | CruelLEGACEY Productions is kinda boring. You should look at Yahoo’s home page and see how they create news titles to grab viewers interested.